Why don’t I know about Sermorelin? Human Growth Hormone (HGH) is known to be a strong anti-aging and muscle building hormone. But it is not without serious side-effects. There are countless benefits to optimizing your HGH production levels, but dosing with HGH can be dangerous. Sermorelin is a natural precursor to HGH and has no known negative side-effects! 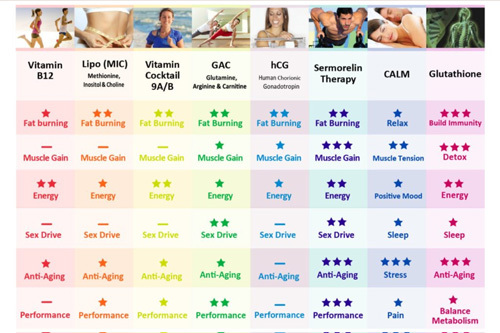 Decreased energy levels, muscle mass, libido, metabolism, quality sleep, and memory loss coupled with increased body fat, blood pressure, cholesterol and wrinkling and aging skin are all signs of aging. Your body can naturally improve in these areas with Sermorelin. While it is not a magic fountain of youth that will change how you look and feel immediately, some of the health benefits are seen more quickly. For example, changes in energy levels, improved sleep and libido can often happen in the first weeks of starting Sermorelin. But it can take up to six months to experience weight loss, improved muscle mass and other biometrics in body composition. Sermorelin stimulates your body’s natural release of HGH. Higher levels of HGH approximate the ‘youthful’ benefits of HGH that we all once had. HGH has a bad name because people who are using it are procuring it illegally and/or off-label and searching for extreme results rather than long term health. Unnaturally high levels of HGH and negative side effects and health risks ensue. Synergistically, Sermorelin works harmoniously with your body these negative side effects and health risks are virtually non-existent. A decrease in lean body mass (muscle) and an increase in fat mass. Correcting hGH levels has been shown to reverse this state by improving muscle mass and reducing fat. Research indicates that hGH deficiency in adults contributes to a reduction in bone density and therefore an increased risk of osteoporosis. The literature demonstrates that hGH replacement therapy for greater than 12 months results in increased bone mineral density and hence, lower risk of osteoporosis. Muscle strength diminishes with age unless intensive exercise is continuously maintained as we pass through the decades. Even so, muscle mass naturally degrades and decreases with age. As hGH therapy corrects body composition and improves muscle mass, muscle strength also improves. The best results are gained after 12 months of hGH therapy. Because bone mineral density and increasing muscle mass and strength work to protect joints, hGH therapy can help to prevent joint deterioration that ultimately leads to osteoarthritis. Optimal growth hormone levels are also essential for connective tissue such as ligaments, tendons and the synovium surrounding joints. Exercise performance is reduced in individuals with growth hormone deficiency. hGH therapy for 6 months has been shown to improve exercise performance by improving muscle mass and oxygen uptake. Growth hormone deficiency leads to reduced resting metabolism.hGH therapy has also been shown to increase protein synthesis, increase fat oxidation, normalize carbohydrate metabolism and reduce LDL (bad) cholesterol. These effects on metabolism may explain some of the other benefits of hGH in addition to improved hearth health and body composition. A decrease in skin thickness and collagen is another effect of growth hormone deficiency. Both conditions are improved by hGH therapy. Though adults with growth hormone deficiency are not normally considered to have a compromised immune system, there is some evidence to suggest that hGH therapy may help regulate immune function. People with growth hormone deficiency have more difficulty with sexual relationships and reportedly, lower energy levels. Many individuals have found improvement in energy, libido and sexual performance under hGH therapy. Reduced psychological well-being has been reported in individuals with growth hormone deficiency and for some, hGH replacement has resulted in improvements in mood, energy and general feelings of well-being. If you’re interested in learning more about Sermorelin, schedule your consultation with us today.